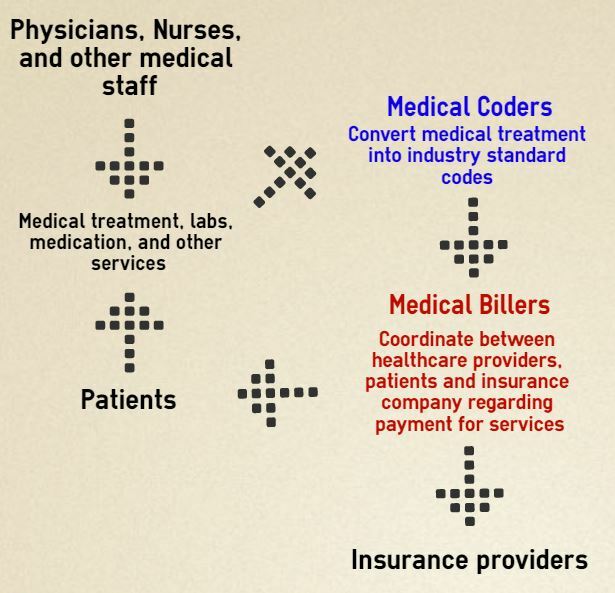 WHAT IS MEDICAL CODING AND BILLING? 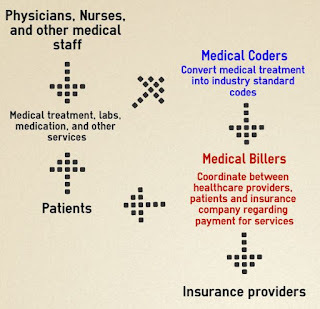 Medical coding and billing is the process of submitting medical claim to the health insurance companies and payers. It is a health care based industry. In this job have to preparing bills and making code for claiming from the insurance companies and other type of payer. This has been done mostly all hospitals in USA, Australia, UK, UAE and European countries now in India. It is a hospital, clinic or home based job also. It is a very responsible job. It is very popular job worldwide now spread in India quickly. A medical biller and coder provides the health care services. They are preparing billing or coding of the diseases, hospital stays and other health related procedures from doctors or health care experts and submitted to payers or health care insurance company such as Medicare, Medicaid. They are employed by the insurance company, law firms, data management and government offices. You can do both part time or full time as your wish. Both day-shift and night shift options are available. The annual income of a medical coder and biller in USA is $34,000 to $45,000 approximately based on their work experience. In India their annual income around 2,00000 to 5,00000 Rs based on their experience. It is a very profitable job but responsible too. If you are a graduate then you are eligible for this course. If you are a graduate with life science or paramedicals then you have a better chance. From any stream you can pursue your carrier with this course. In America, AAPC (The American Academy of Professional Coder ) offers 4 months duration online course at the cost of approximately $1500 and AHIMA offers approximately $2500 for a 15 months online course. Also there is a certificate course of many company offers. They also offer work from home and placements. You must have a computer or laptop with internet connection for work from home option. In India it is very demanding profession now. It spreads all over in our country. In India there are many companies who provides medical coding and billing course. I share some of their links. 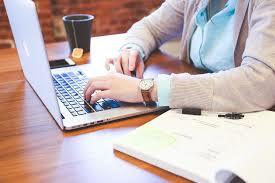 These companies also provides online courses and office based courses both. They charge around 50,000 to 75,0000 for office based program and 20,000 to 30,000 online courses. They also provide placements and work from home options. So, if you are responsible and graduate then you can start your carrier in this field. It is a very demanding profession in India and throughout the world. Best of luck! Please comment!.